GRAND RAPIDS -- Parents and children alike love the lighted Christmas trees at the Museum's annual Christmas on the Grand. Tuesday November 10, 2009 7:30 p.m.
ANN ARBOR -- James Kitfield, 2009 winner of the Gerald R. Ford Prize for Distinguished Reporting on National Defense, spoke at the Gerald R. Ford Presidential Library on November 10, 2009. Mr. Kitfield is is presently the national security and foreign affairs correspondent for National Journal magazine, an independent and non-partisan newsweekly on politics. He has written on defense, national security and foreign policy issues from Washington D.C. for over two decades. Grand Rapids -- Kenneth T. Walsh, winner of the Gerald R. Ford Prize for Distinguished Reporting on the Presidency in 2008, spoke at the Gerald R. Ford Presidential Museum on Wednesday, October 14, 2009. Walsh is the White House Correspondent for U.S. News and World Reports. His speech was on President Obama and his first year in the White House. Grand Rapids -- Michael Kaiser, Director of the Kennedy Center for the Performing Arts, spoke on arts management at the Museum. Left to right: Ford Presidential Foundation Director Joe Calvaruso, Michael Kaiser, Ford Presidential Library/Museum Director Elaine Didier. Grand Rapids -- On Tuesday, September 29, 2009 the ArtPrize artists whose work was on display at the Gerald R. Ford Presidential Museum met with visitors at a reception held in their honor. 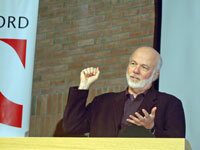 Grand Rapids -- Dr. Bustard spoke at the Ford Museum before a large crowd. Visitors gathered at the opening of Picturing the Century, an exhibit of over 100 photographs depicting the sweep of 20th century America. Dr. Bustard served as lead curator for the exhibit and selected the photographs. The exhibit is sponsored by the Gerald R. Ford Foundation. Grand Rapids -- Grand Rapids' Boy Scout Troops honor the flag in a day long ceremony in commemoration of September 11, 2001. Ann Arbor -- William Seidman, chief commentator on NBC cable network's CNBC and publisher of Bank Director magazine discussed the U.S. economy at the Gerald R. Ford Presidential Library. William Seidman is the former Assistant of Economic Affairs and Executive Director of the Economic Policy Board, under President Gerald R. Ford. Grand Rapids -- Join Bess Abell, Maria Downs, and Laurie Firestone, all former Social Secretaries, as they discuss the social side of the nation's executive mansion. Bess Abell was Mrs. Johnson's Social Secretary from 1963 through 1969. She also served as Mrs. Johnson's assistant through the vice presidential era. Maria Downs became Mrs. Ford's Social Secretary in October of 1975 and remained in the position until the end of the administration. Prior to becoming Social Secretary, Ms. Downs worked in the White House Office of Bicentennial Liaison. Laurie Firestone was named White House Social Secretary in 1988 by First Lady Barbara Bush. She also served as Mrs. Bush's social secretary during the vice presidential years. The panel highlighted the Johnson, Ford and Bush 41 White Houses. 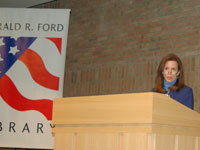 Ann Arbor - Patti Matson, former Assistant Press Secretary to Mrs. Ford, kicked off Mrs. Ford’s 91st birthday celebration (Mrs. Ford’s birthday is on April 8th) with her lecture on at the Gerald R. Ford Presidential Library. Her talk, titled “Betty Ford: Strength in a Package Marked Fragile,” offered insight into one of our nation’s most admired First Ladies. The program also included stories and memories of the Ford White House. GRAND RAPIDS -- In Betty Ford's brief and unexpected reign as First Lady, she broke the mold. She was a pro-choice Republican who became the first First Lady to take on a feminist agenda and differ publicly with her husband. Coming to office in the wake of the Watergate scandal and President Nixon's resignation, Betty Ford and her family were a breath of fresh air in the White House. The public was treated to scenes of a real American family, funny, casual, enjoying life. She and her husband loved to throw parties and open up the White House. Her ability to be open and honest about her battles with breast cancer and drug and alcohol abuse saved millions of lives. Mrs. Ford, her four children, family friends, White House colleagues and historians discuss with amazing candor and sensitivity the life and times of Betty Ford, her time as First Lady and her impact on American women and their families. 2008 Winner of the Gerald R. Ford Journalism Prize for Distinguished Reporting on the Presidency. Monday, March 9, 2009 7:30 p.m.
ANN ARBOR -- Join Peter Baker, former senior White House correspondent for The Washington Post and presently reporting on the White House for The New York Times, as he provides his keen insight and perspective on the new administration. Press release click here. An annual essay competition for West Michigan High School students. This year, the theme was "Patriotism Today". The 18 finalists were presented awards during a ceremony at the Ford Presidential Museum on Presidents Day, 2009. Secretary of State Terry Lynn Land was the keynote speaker. Over the weekend, teen author Noah McCullough discussed his book First Kids: The True Stories of All the Presidents’ Children (Scholastic, 2008) at the Ford Presidential Museum and Library. Noah's fascination with U.S. Presidents happened as a result of the 2000 election. He was intrigued as a kindergartner about the electoral college, party system, campaigning and the fact that all throughout history presidents have shown themselves to be just ordinary people serving in an extraordinary position. GRAND RAPIDS -- When Jim Getty takes the stage, he is Abraham Lincoln. Getty brings Lincoln to life: audiences see and hear the President recount his homespun stories of youth, his recollections of his personal and political life, and his special anguish for Gettysburg. Tim Connors is a life-long resident of Freeport, Illinois, where he is director of speech and theatre for the Freeport Public Schools. Under his direction, Freeport has produced nearly two-dozen state qualifiers in the annual IHSA Speech Competition, eight state finalists, and one state champion. ANN ARBOR - - It was an opportunity to meet and hear our own Abraham Lincoln, Mary Todd Lincoln, and members of the Dodworth Saxhorn Band with their original “Saxhorn” instruments and dress of the mid-1800s. Professional re-enactors, Fred and Bonnie Priebe, were President Lincoln and Mary Todd Lincoln. Friday, January 30, 2009 7:00 p.m.
GRAND RAPIDS -- White House Curator Emeritus Betty Monkman opened the new feature exhibit The White House in Miniature. Ms. Monkman has worked in the White House curator’s office since 1967, first as museum registrar, then associate curator, and since 1997 as curator. She planned and curated the first exhibition on the White House in 1992 and continues to work closely on other exhibits at the White House Visitor Center. She has written a number of articles on the White House decorative arts and has lectured throughout the country. Contemporary Lessons from a Legendary Leader January 29, 2009 7:00 p.m.
GRAND RAPIDS -- Best-selling author of major works of nonfiction, Don Phillips is know for his ability to tell stories and bring history alive with crisp compelling prose. His trilogy on American leadership (The Founding Fathers On Leadership, Lincoln On Leadership, Martin Luther King, Jr. On Leadership) has won worldwide acclaim. His first book, Lincoln On Leadership, helped pave the way toward the creation of an entire new genre of books on historical leadership. Wednesday, December 3, 2008, 7:30 p.m.
ANN ARBOR - - An interactive forum co-hosted by the National Press Club and the Gerald R. Ford Presidential Library. Hear what the experts have to say about the First Amendment, freedom of the press, and the future of journalism in the 21st century and beyond. Local SE Michigan panelists include Vincent Duffy, Gil Klein (NPC), Jonathon Wolman, Marla Drutz, Richard Ryan (NPC), and Omari Gardner. ANN ARBOR - - The 2008 William E. Simon Lecture on Public Affairs welcomed David S. Broder to the Gerald R. Ford Library. David Broder is a national political correspondent for The Washington Post, and has covered every national election since 1960. Mr. Broder is a regular commentator on CNN's "Inside Politics," and makes frequent appearances on NBC's "Meet the Press" and "Washington Week in Review.” Mr. Broder discussed the political landscape following the November elections. Wednesday, November 12, 2008 7:30 p.m.
GRAND RAPIDS - - ESPN personality Tim Kurkjian has an extensive background in baseball. Kurkjian began covering the sport in 1981 for the Dallas Morning News. Currently, he can be seen on ESPN's Baseball Tonight and is a senior writer for ESPN The Magazine. Kurkijian's visit to the Gerald R. Ford Museum is in conjunction with Born to Play Ball, an exhibit that looks at the 50 best players in recent history. GRAND RAPIDS -- Norm Coleman brought "The Georgia Peach" Ty Cobb to life in his one-man show at the Gerald R. Ford Museum in Grand Rapids. Grand Rapids -- Tim Weiner, a Pulitzer Prize winning reporter for The New York Times, lectured at the Gerald R. Ford Museum in November 2008 on his book Legacy of Ashes: The History of the CIA. GRAND RAPIDS -- Pulitzer Prize nominated journalist Dale Van Atta spoke on the Nixon and Ford Administrations. Van Atta wrote the first-ever biography of Melvin Laird, Nixon's Secretary of Defense. A book signing and reception followed. ANN ARBOR - - Jay Hakes was head of the Energy Information Administration at the U.S. Dept. of Energy from 1993-2000, where he oversaw the collection and dissemination of America’s official energy data and analysis. Currently head of the Jimmy Carter Presidential Library, Mr. Hakes presented his compelling and informative book, A Declaration of Energy Independence. Saturday, October 4, 2008 2:00 p.m.
and baseball to present an educational and entertaining program, which will be appealing to Museum visitors who are fans of our two national pastimes: baseball and the Presidency. Tuesday, September 23, 2008, 7:30 p.m.
ANN ARBOR - - Winner of the 2008 Gerald R. Ford Prize for Distinguished Reporting on National Defense, Rich Atkinson is a longtime correspondent and editor for The Washington Post. Mr. Atkinson presented the paperback release of The Day of the Battle: The War in Sicily and Italy, 1943-1944, the second volume of his Liberation Trilogy. Grand Rapids -- President of the Baseball Hall of Fame Jeff Idelson shared stories about baseball and baseball players in a talk on August 7, 2008, at the Ford Museum in Grand Rapids. The talk celebrated the opening of the Museum's exhibit Born to Play Ball (August 7, 2008 - January 4, 2009). GRAND RAPIDS, Mich., July 14, 2008 - In commemorations of the 95th birthday of President Gerald R. Ford, individual wreaths from President George W. Bush, Mrs. Betty Ford and the Ford Family were placed at President Ford's Tomb on the ground of the Gerald R. Ford Presidential Museum in Grand Rapids, Michigan during a ceremony earlier. GRAND RAPIDS -- Richard Norton Smith delivers the 2008 Simon Lecture at the Gerald R. Ford Museum. The lecture was titled "What Would Jerry Do?". Museum Director, Elaine K. Didier welcomes the Museum's Three Millionth visitors on Tuesday, June 17, 2008. Cindy Lund (in green) was given an autographed copy of President Ford's autobiography. Susan Bales Ford and Steven Ford called Lund to congratulate her. Also photographed are Museum Director Elaine Didier, Steve Lund, Connie Dieleman and her children Angela and Daniel. Grand Rapids -- Lead White House photographer, David Hume Kennerly shared stories about photographs taken during the Ford Administration in a talk on May 14, 2008 at the Ford Museum in Grand Rapids. Grand Rapids -- Tim Naftali, Director of the Richard M. Nixon Presidential Library, discussed his new book "The Suprising Presidency of George H.W. Bush," on April 21st at the Gerald R. Ford Presidential Museum in Grand Rapids. ANN ARBOR — In celebration of Mrs. Ford’s 90th birthday in April, Betty Ford Center Director John Schwarzlose spoke about the legacy of the institution to which she has been forever linked as its co-founder and chairman. ANN ARBOR — Robin Wright, Middle East correspondent for the Washington Post, spoke about her new book Dreams and Shadows: The Future of the Middle East. GRAND RAPIDS -- An evening with the Lincolns. With Michael Krebs and Debra Ann Miller as President and Mary Lincoln. GRAND RAPIDS -- Diana Walker, photojournalist, opened a Museum exhibit of photos spanning 30 years of White House life. The exhibit runs through April 27, 2008. GRAND RAPIDS -- Kasey Pipes spoke about his latest book, "Ike's Final Battle". The event was co-sponsored by the Hauenstein Center for Presidential Studies. ANN ARBOR -- David Hume Kennerly, Pulitizer-Prize winning photojournalist and personal photographer to President Gerald R. Ford, opened a Library exhibit of photos from his new book, Extraordinary Circumstances: The Presidency of Gerald R. Ford. The exhibit runs through March 15.